Hello Commuting Kings and Queens! Today, I wanted to write about the importance of sleep! Now, I know what you’re thinking… Julia, sleep is always important you silly goose! Well yeah, it definitely is and everyone should work hard to ensure that they are meeting their sleep needs. However, I have noticed that since I have started commuting, my sleep is even more important than it ever was before. What I mean by this is that before I began my journey as a commuter, if I was not able to get a good night’s sleep it really did not impact me very much. I would yawn a lot during my classes, but then I got to walk the five minutes back to my room and take a nap! 1. 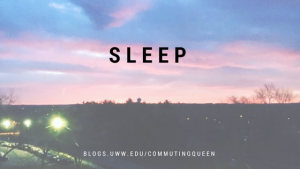 Get more sleep: This is definitely the most important of my tips. You should certainly be doing your best to ensure that you are getting enough sleep to wake up well rested and ready to take on your day! Leave your electronic devices far away from your bed and be sure that you are not stimulated by anything else to help you fall asleep quickly. Whether it means you are going to sleep earlier or that you are ensuring that your morning routine is as short as possible, it is crucial that you find a way to get as much sleep as possible. 2. Drink caffeine: I know that this does not help everyone, but if your body likes/tolerates caffeine be sure to have some on hand. I don’t typically recommend energy drinks but a nice drink like a hot tea with caffeine or coffee. This should not replace sleep, but they can help you to feel more energized. 3. Eat healthy throughout the day: Healthy foods give you positive energy. It’s a fact, you can certainly look it up. Eating healthy foods during your day can energize you for long periods of time. I highly recommend it and in fact, I will most likely be writing a blog about this topic in the near future. 4. Move around: My final tip for you today is to move around whenever possible. If you feel yourself getting tired before a long drive, you should do your best to get moving. Maybe you could stand in the back of the room during the last ten minutes of class. Perhaps there is an opportunity for you to leave the room altogether and walk to the end of the hall and back. Whatever you can do besides sitting will usually be extremely beneficial for you. So there you have it. These are just the ticks that have worked for me. However, they are not the only tips to help you out. If you have other tips or tricks for this topic, please feel free to comment them below! I hope this post motivates you to take care of this important aspect of your life! This entry was posted in Tips&Tricks and tagged caffeine, commute, healthy, move, sleep. Bookmark the permalink.